Sorry I haven't been around for awhile. 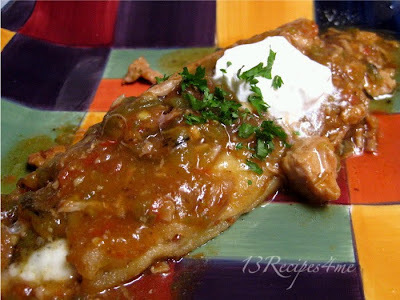 If you are in the mood for a little bit of Mexican Food, here is one of my favorites. My mom used to make these when I was growing up. 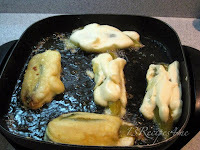 We ate them plain, but Michael likes them with green chili. The secret to keeping the egg batter is to chill your bowl. 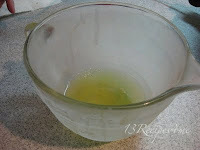 I use a glass measure and place it in the freezer for 10 minutes before I beat the eggs. Separate the yokes from the whites, adding whites to frosty bowl. Save the yokes to add later. 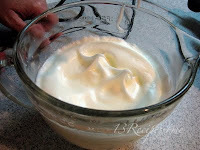 Beat egg whites until stiff. That means when you turn the mixer off and pull out the beaters, white peaks form and fold over in a nice curl like a fancy ice cream cone. Some people add 1 TBS of flour here. I don't since I'm cooking gluten free. 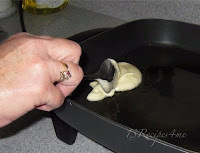 But I do add the yokes into the whites and gently fold them in. They fold in nicer when you beat them first instead of plopping them as I have done. 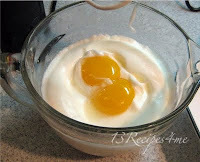 But since the bowl is chilled, the egg whites are very forgiving. Mix the cheese and onions together. Open can of chilies, rinse and remove seeds and membranes. You can leave them whole or split one side open. This batch of chilies had a lot of skin still attached that should be removed. 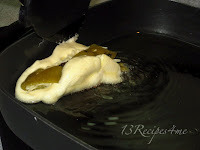 Then stuff them with the cheese mixture. I tried to leave mine whole, but they split apart multiple times. If this should happen, gently squeeze the chili around the cheese. If you use fresh grated cheese instead of pre-grated, it sticks together fairly well. The stuffed chilies...I know, not terribly pretty. 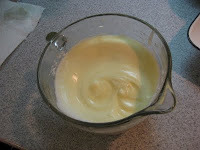 Spoon egg mixture about the length of a chili into hot oil. 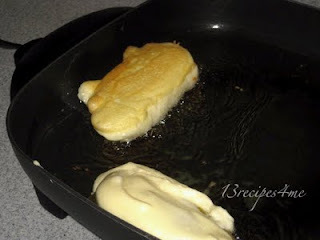 Important-do not place hot spoon back in egg mixture. Have a plate or spoon holder to set it in until you are ready for the next one. Gently place stuffed chili onto egg. Using a spatula, quickly push egg up around sides of chili. If you can't get it to cover the chili, you can spoon a bit more egg onto the top. Let it cook until sides begin to lightly brown. The egg cooks rather quickly, usually in less than a minute. Gently flip them over to brown the other side. Can be eaten naked, with sour cream or guacamole. 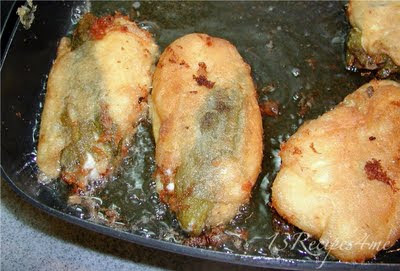 Even better is if you have a pot of green chili waiting to be poured over the rellenos. Superb! If this is too much trouble, and you aren't eating gluten free, you can take the stuffed chilies and wrap them in egg roll wrappers instead of the egg mixture. This will make a very crisp outside. But I can't think of them as authentic Mexican food when fried in egg roll wrappers. Still tasty and less messy. You choose.